Community Animal Rescue and Adoption (C.A.R.A.) decided, we are told, to kill every single cat (120) at their facility because of an outbreak of calicivirus. One of the volunteers who used to work there but who was ‘let go’, Kelli Ware, felt compelled to speak out. She said that it was impossible to test all the cats. She also said that of the few that were tested some came back negative for the calicivirus. This implies that testing was not thorough enough but I don’t know the full story. It is reported on the WJTV.com website. 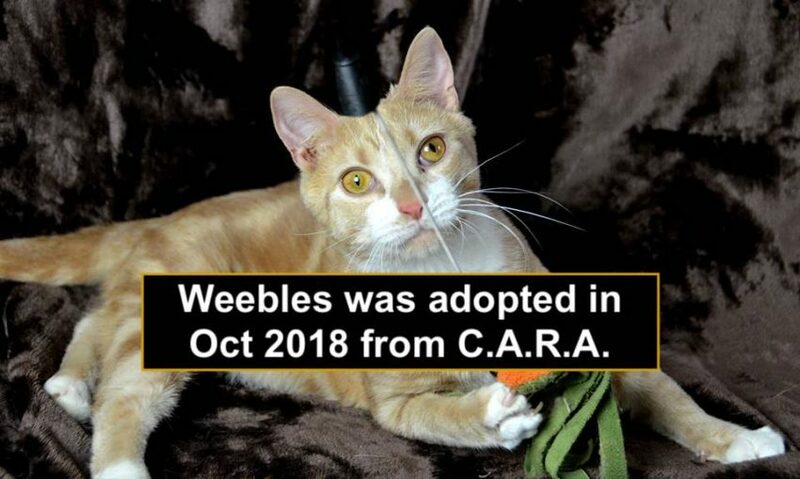 Cara cat Weebles was adopted last Oct. Photo: C.A.R.A. The description of the evens begs the question as to whether management made the right decision in euthanising such a large number of cats. They will argue that they had to because, as we know, it is a highly contagious disease which can rapidly move through a shelter. It is one of the most common infectious diseases amongst cats. There is, however, a wide variation in the severity of the illness. Some cats have mild symptoms while others suffer badly and it can even be fatal. The treatment is to isolate infected cats for 3 to 4 weeks to avoid them infecting others. In addition bedding, bowls, cages et cetera need to be disinfected. Humans need to change their clothing and wear disposable shoe covers and washed hands frequently. My reading of the treatment is that it takes time but with rest and feeding highly palatable foods together with other treatments such as cleaning secretions from the eyes nose and mouth and shrinking swollen nasal membranes, cats normally recover. This then further begs the question as to why it was impossible for this to be done. The C.A.R.A. post indicates that other shelters were unable to help. All veterinarians will agree that calicivirus is treatable and it is preventable with vaccination. Questions are therefore being asked about the management at this facility. I went to their Facebook page to see what they had to say. Management made an announcement on January 20 at 1:12 AM which you can see below. They do not mention, understandably, that they felt compelled to euthanise all 120 cats. You can see that they are making extensive changes including changes to the staff. They hint that either one or more staff member made a mistake by which I mean, to use their words, “veer from intake protocols and quarantine”. They obviously made a decision to euthanise with a heavy heart. It must have been devastating. It appears that some supporters might, in future, be withdrawing donations. “I know I’m gonna get retaliation for this, but I feel like my job is to speak for those the ones who don’t have a voice,” Ware said tearfully. It seems that she is genuinely concerned about the ‘business’ because she wants it to succeed. She is concerned that not all options were exhausted although she recognises that it is a highly contagious virus. Source – CARA FB Page. The herpes virus is the other common URI infection causative agent. This entry was posted in upper respiratory infections and tagged calicivirus, contagious diseases by Michael Broad. Bookmark the permalink. What is their intake protocol? They mentioned in the facebook posts that they don’t test for viruses, but do they vaccinate all incoming animals? If yes, then calicivirus is a core vaccine included in the combo kitten/cat vaccines that they would have gotten on intake. So a lot of them should have been protected from coming down with clinical symptoms. If only a few were tested and some came back negative as stated above, there needs to be more of an investigation into their choices here to wipe out the whole group. Did it come down to lack of money and resources to care for them??? Who made the decision? Good questions and the shelter have not been open about this. They admit that they failed (i.e. in terms of protocol). Their Facebook post does not say that they killed the cats, as I recall. The news media tell us they killed the cats. This is truly heartbreaking…I don’t understand why all could not have been treated and the shelter closed during this time to ensure all the kids would be well cared for. Killing all just seems to be a piss poor excuse and an easy fix. I agree with Jane and Albert in their comments. This is so shabby, as usual, poor, poor cats. How many more times do we have to learn that cats have been slaughtered due to piss poor shelter practice? I would have some serious questions for the veterinary supervision of this shelter, as well as for the management. It is far to easy, and lazy, to blame the workers & volunteers. So? Send enough money that they all need to quarantine and pay for the costs for tests and vaccines for every cat that comes into every shelter for as long as it takes. Do something about it, don’t just complain about it. You’re right, it’s far too easy and lazy to blame the workers and volunteers. This is your fault and the fault of everyone just like you for not helping them at all. Ok, Troll *rattles keys* back to your cell. Your rage exposes your lack of lucidity. More ECT for you. No argument. People who have a job of caring for animals need to do better than this. When you’re in a position of responsibility, you need to actually be responsible and not just kill your way out of a problem. This is shameful and beyond sad.